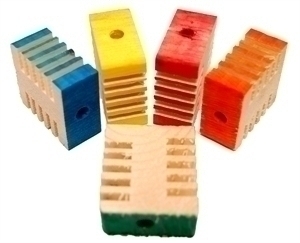 Package of 10 grooved blocks, 3/4" wide, with small hole in center. Great foot toys for larger birds, or string on rope, leather, or skewers to make great toys. A bit hit with the Birdsafe conures! These blocks are great. Heart of Feathers Education teaches foraging and enrichment for Companion Birds. This block is awesome to teach birds to forage. You can hide yummy treats in the slots first. When the bird is an advanced forager, stuff the yummy stuff in the holes. 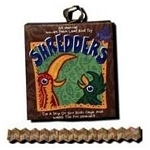 This is an universal block to come up with fun enrichment for any birds. 1) Hide healthy flowers or straw in the holes for small birds. 2) Hang on a leather rope, and add yummy stuff. Do not miss out on a fun blocks. I have a rescue Maximilian Pionus, she was untrained when I got her...not a toy lover... now, five years after rescue, she has finally started to chew on toys..I figured out what she likes. This was a new toy for her...just gave her one at the bottom of her cage...took her a day to warm up to it, but now she’s chewing it up and loving it...not hard wood, so she can gnaw on it easily without injury. Definitely will buy again when we run out.